This year I have an abundance of hibiscus at my house. 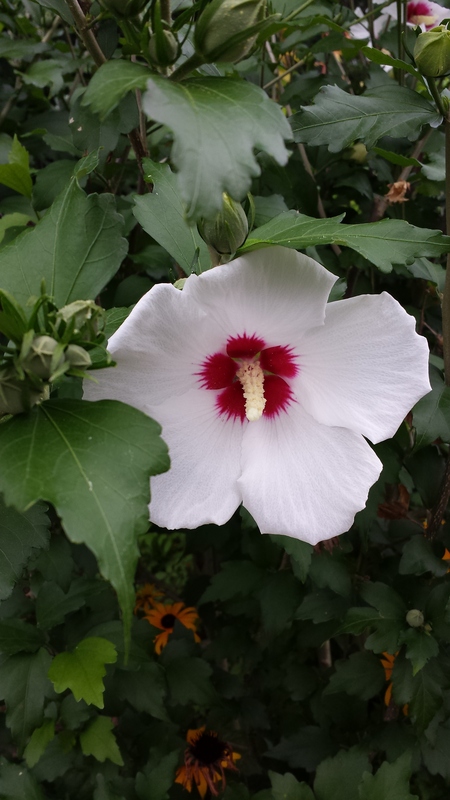 In addition to the perennial shrub type hibiscus which I’ll show in a minute, I got this tropical variety (hibiscus rosa-sinensis) (which is also perennial somewhere–in Florida and Hawaii for example, but certainly not in my climate unless I bring it in and put it in a very sunny window!). My plan was to put it near the “pollinator pots.” You see the zinnia right behind it–and to use its color to draw the insects in than for any real value to pollinators. But just last night the Spoiler was raving about how much he liked what I have done with the containers this year so he is at least pleased. The jury is still out about whether I’ve helped the pollinators. 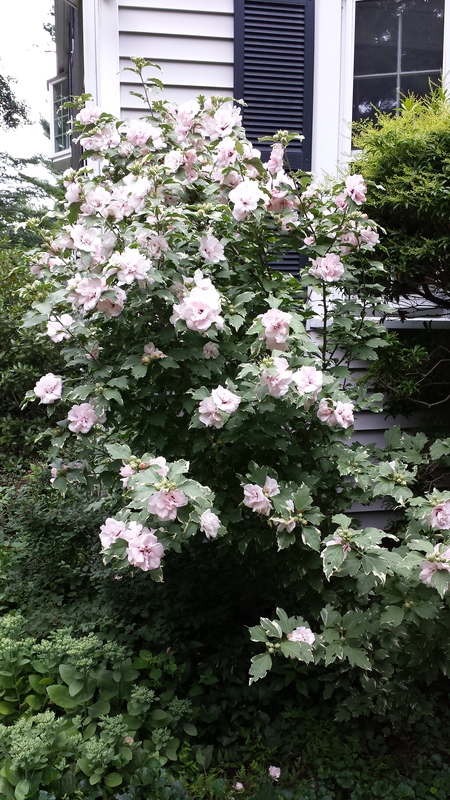 This hibiscus ( a type of hibiscus syriacus) is my powerhouse for pollinators. You can see the pollen dripping from the center of this flower. Unfortunately, it’s a messy plant and it seeds itself everywhere. But heck, I guess I can put up with that for its wildlife value. It is, after all, in the wildlife garden. 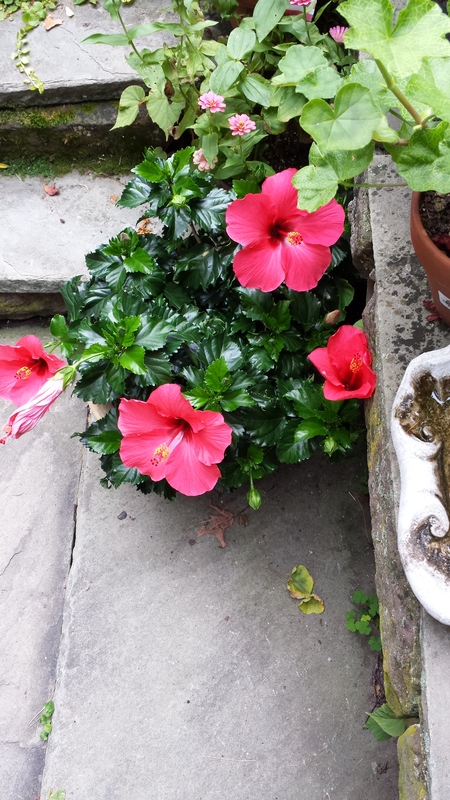 This is a segment of that garden where the hibiscus is growing. 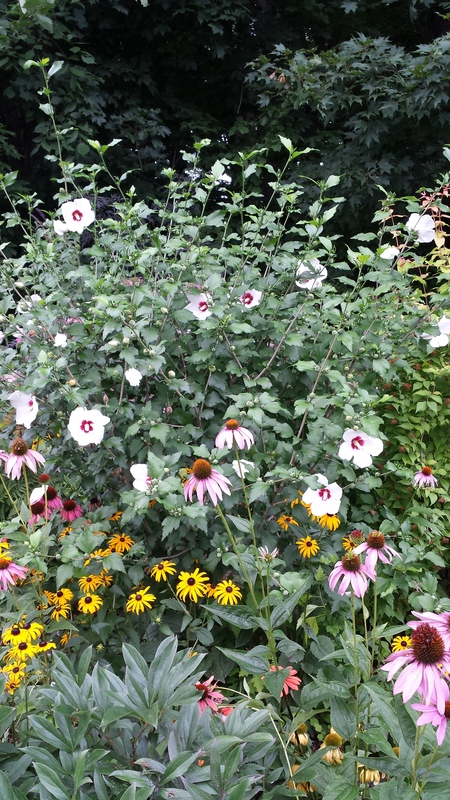 You can see a few remaining black-eyed susans that I didn’t pull out when I did the renovation and added all the echinacea. Their foliage is pretty much untouched by that insect–so far–and completely disease free, despite the over-crowding. 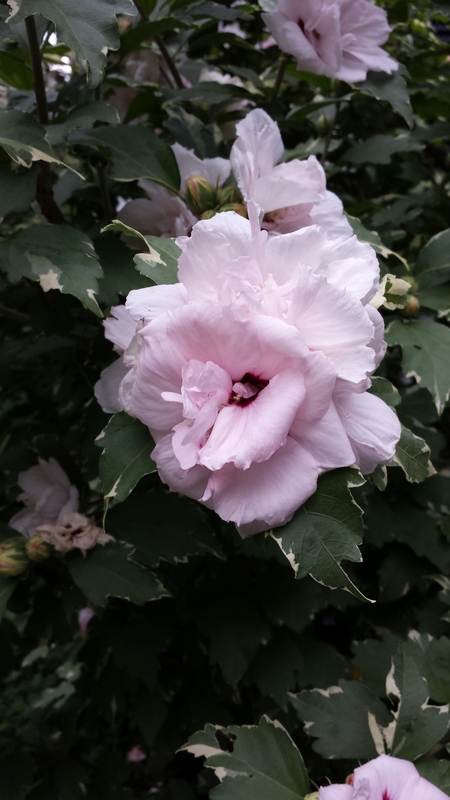 This is Sugar Tip hibiscus, the other type of hibiscus is have. It’s spectacular in every way–leaves, flowers and maybe best of all, it’s sterile so I am not forever pulling up literally hundreds of seedlings every spring from underneath it. But of course, there’s a trade-off. Although I see lots and lots of bumble bees inside these flowers, there’s no pollen. I feel terrible. I feel as if I am “tricking” them with this plant. They could and should be other places in my yard. It makes me want to take the plant out just for that reason. Here’s a close up of the flower. Notice the pretty variegated leaf as well. It’s heart-breaking. Previous Article Wordless Wednesday–Things Are Busting Out All Over! Next Article What’s Wrong With The “Cone” in My Cone Flower?